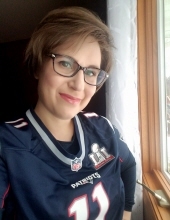 Andrea Susan Zinn, 38, of Eau Claire, died peacefully July 10, 2018 at Mayo Clinic Luther Campus from metastatic breast cancer. Born on March 25, 1980 in Hayward Wisconsin and is survived by her parents Jerry and Judy (Zawistowski) Michalski, her husband Justin (married October 24th 2009), step daughter Katherine and grandmother Evelyn Zawistowski. Nothing short of Amazing in how she lived. A Memorial High School Graduate, she participated in Volleyball, Softball, Choir & Show Choir. Volunteered for the Library and Historical Society in college. Graduated with Honors from the University of Wisconsin Eau Claire. Highly recognized and outstanding Application Epic Ambulatory and Oncology Analyst. Devoted wife and step mom. Participated in numerous support groups educating and giving hope to others battling cancer. And found solace in nature and birding. Service will be held Saturday, July 21, 2018 at Stokes, Prock & Mundt Funeral Chapel, 535 S Hillcrest Pkwy, Altoona, WI. Viewing is from 2-4pm with a short service at 4pm. In lieu of flowers please make a donation for research to Cancer Couch Foundation (www.thecancercouch.com). "Email Address" would like to share the life celebration of Andrea Susan Zinn. Click on the "link" to go to share a favorite memory or leave a condolence message for the family.